The development of a new generation of photonic integrated circuits and the constant progress in integrated electronics (following Moore’s law) made the realization of a new type of optical transport node possible, by basing it on the concept of a digital photonic switching layer working in coordination with the packet switching layer under the control of a multi-layer control plane. 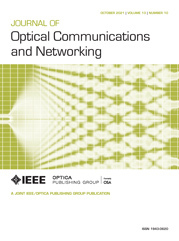 In this paper such a new type of optical transport node is presented, analyzed and implemented in order to better investigate its potential advantages and weaknesses if compared with the conventional all-optical transport nodes and their level of applicability. The new node concept is based on a “vertical” view of packet–opto networks able to face the challenge of growing network capacity while cutting costs and to allow an efficient combination of digital optical networks and packet–opto integration’s benefits. Thanks to the use of optical–electrical–optical conversion technology, the wavelength division multiplexed (WDM) layer is provided with the traffic management flexibility and the engineering simplicity of digital transport systems (significant operational expenditures reduction) and with the network cost savings of large-scale photonic integration (capital expenditures reduction). It combines packet and WDM switching technologies where appropriate, with the ability to offload pass-through traffic from the packet layer to the lowest possible layer, so as to reduce costs and power consumption by eliminating unnecessary packet processing (total cost of ownership reduction). The main building blocks are a new digital optical transport based on an integrated packet–opto node that is scalable, flexible and low cost, and multi-layer control and management based on standard generalized multi-protocol label switching and innovative path computation element (PCE) solutions. Thanks to the flexibility of the digital reconfigurable optical add/drop multiplexer, the PCE is able to handle both layers in a very efficient way by selecting the right granularity for traffic grooming and routing. The feasibility has been assessed by a network prototype composed of four nodes produced by Ericsson Research Lab in Pisa and by a simulation analysis.